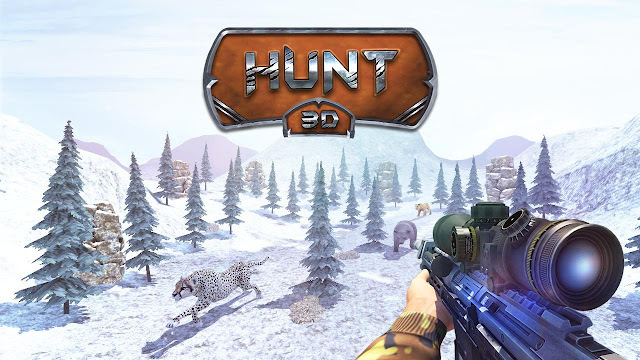 Hunt 3D - is an incredible shooting game to hunt wild animals in the jungle. Enjoy the latest hunter game with dangerous wild animals to kill from all over the world. Immerse yourself in a vast jungle environment to kill the huge animals but try to hunt them down before they do so. Become an incredible and most wanted hunter by killing dangerous predators from all over the world. Hunt deer, bears, cheetahs, rhinos and many more ferocious animals. Enjoy the unique feature by taking your own picture with hunted animal and share with your friends. Now you can experience the ultimate shooting from helicopter, enjoy the chopper view and become wild hunter! While hunting customize all your weapons by upgrading scopes, barrels, magazines etc. for the perfect shot. Take down all the dangerous predators from car roof and take the hunting to the next level. Aim and shoot to kill the animals from running car and be the best shooter. While playing this incredible hunting game, you can earn best hunt badges to become the best hunter. Hunt 3D: install APK and play the game.